We are working in partnership with thought leaders ?WhatIf! 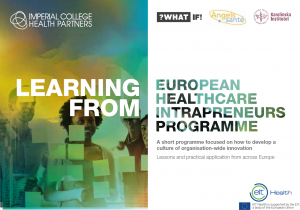 Innovation, Angels Sante and the Karolinska Institutet to deliver Learning from European healthcare: Intrapreneurs progamme, a short course aimed at supporting both executive and front line staff to adopt and scale innovation in their everyday roles. The purpose of the short programme is to support participants to develop their capability and capacity to adopt innovation, to address healthcare challenges in their organisations. The programme will have a a strong focus on supporting participants to learn how scout for existing best practices and adapt solutions to their environment. During the programme they will also hear from examples of best practice from across Europe. An opportunity to identify at an individual level how you will make a tangible difference to the performance in your area of responsibility. This is a programme for both clinical and non-clinical staff from primary and secondary care settings. It is aimed at senior leaders, support staff and front line staff, and particularly those involved with the creation of hospitals and healthcare entities as learning organisations. Attendees should already have some experience in, and capability of, delivering quality improvement, and also be willing to take these skills a step further. The full programme outline is detailed below, and can also be downloaded. The three day workshop takes place in Paris from 6-8 November, with the pre and post-programme work at home. Participants will be required to read through materials ahead of a workshop, in order to explore how other organisations have created sustainable innovative cultures and infrastructures. They will also need to prepare information about the current challenges they are facing in their organisation, and initial ideas for innovation. The first day of the workshop will focus on understanding participants’ current organisational challenges, using expansive, design and systems thinking. During the second day, the workshop will focus on the importance of leadership for innovation. In particular, it will look at how we develop and create innovative leaders, with some time for self-reflection as part of this exercise. During the third day, participants will be encouraged to devise an action plan for their innovation project. They will hear from other industries to help inform their plans moving forward. There will be a follow-up online group webinar with participants one month after the workshop to find out about progress, as well as providing coaching through any challenges they may be experiencing. What are the learning outcomes from the programme? At the end of the programme, participants will have an increased awareness of the beliefs and assumptions that guide their decisions and behaviours on innovation, and how these can be changed to help shape innovation in their organisations. The programme will also offer an opportunity to share learning with peers, and to also learn from best practice in this area from across Europe. Front-line staff will gain hands-on experience through delivering a live innovation project in their organisation, and sharing their approach with colleagues. The fee is €1950 per person for non-ICHP members, but travel costs and accommodation are not included. The application deadline is midday on Friday 5 October 2018. All applicants will be notified of the outcome on Monday 15 October 2018.